This 50 inch value offering from Sony falls near the bottom of it's lineup totem pole for 2013 and thus strives to offer a great price even though the screen sizes are getting larger. The KDL-50R450A has lots to offer the value shopper however as Sony makes reliable TVs with their superior video chip sets (even if the other parts are made by other manufacturers). 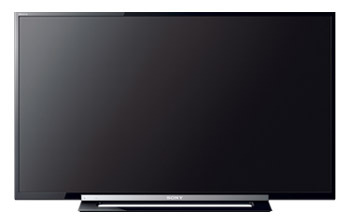 Sony has Direct LED specification on this LCD HDTV, which means that rather than CCFL fluorescent backlighting you get LED backlights (full array). This is not to be confused with the more robust and bright edge-lighting LEDs that Sony uses in their higher end models. The LED backlights adds some depth to the TV. The 120Hz panel is a needed upgrade from the 40 inch version of the R450A. The 50 inch screen size panel though you will obviously get some judder and stutter during fast motion images or slow panning side to side. The Motionflow XR 120 feature can be enabled to help with some of those problems when it comes to live sports programming and video games. Colors are a bit washed out from side angles on the KDL-50R450A but it's still passably good. The highlight is the crispness of images when viewing HD signals. Sony recognized the need to step up to 1080p in the 50 inch size model (from 720p in the 32). The KDL50R450A has an anti glare flat coat to the screen that actually ends up reflecting light rather than keeping it from irritating the picture. It results in some glare from in-room lighting. It's not a favorite feature, but it is cheaper to produce and helps keep the cost down. Black levels are still decent on this TV, you just dont get the best depth production for your viewing. Color is accurate but not close to the top Sony models, which have the best color and crispness in the market. There are not many extras on the KDL-50R450A. There is no 3D, or Smart TV features. There is a USB port for easy playback, and another special feature you may want to play around with called the MHL-ready. This is for mirroring the screens on NFC compatible Smart Phone devices (sorry no Apple yet). There are only 2 HDMI inputs. The menu system is easy to understand and gives 4 preset picture mode options. Motionflow: We recommend turning this feature off for film and normal content and leaving on for live sports action or 3D programming. The Standard or Clear settings are good when on. The feature does decrease judder and jerky camera panning somewhat and this may be especially useful for sports programming. Fluidity in the picture during fast action or camera panning is the objective of the Motionflow XR 480 feature. The 120 specification is to alert you to the fact that the backlight is helping to make the native 60Hz panel process faster (hopefully to what seems like 120Hz). Results are usually quite mixed on these features with fast action sports looking great and movies and other film based material having some unwanted complications. Most other “extra” pictures features like the Clear Resolution Enhancer are better left off. Since the 50R450A has full LED backlighting it is not the super thin edge lit LED. It's around 3.5 inches in depth, has a thin half inch black gloss bezel frame, and a nasty chrome strip across the front bottom which I think it both reflective and distracting. One plus though to the model is that it sits very low just and inch above table top depth so it will fit into tight spaces well. This is a bang for the buck 50 inch model from Sony that features full HD 1080p resolution and is priced to be a big seller for the year. The appearance of the TV is nice for the price point and you get the Sony name and internal workings over other 2nd tier manufacturers in the marketplace. It's a winner in price comparison with both the Samsung UN50FH5500 and LG 50LN5400 with which it competes selling for $100 less.